Today’s Flashback features an original blog posting in its entirety that was submitted on a previous blogging gig on July 12, 2013. 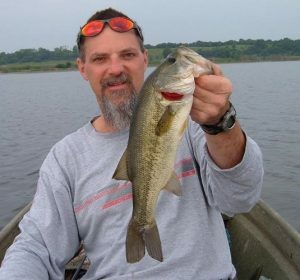 The report gives the lowdown on a trip that Dad and I took to The Emiquon Preserve, a Fulton County, IL fishing hole that was the most amazing public fishery I have ever fished. 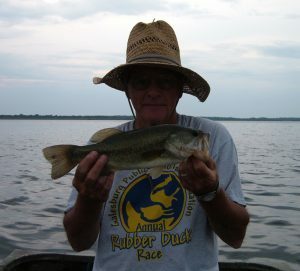 The place was full of hard fighting, quality bass and always made for some sort of interesting fish story. Five years later, it sounds like all of that has changed as those charged with the care of the fishery have elected to destroy it. Funny, in a not so funny way, that the first two lines in the old report below take on a whole different meaning nowadays. The not so old destination has a whole new look. 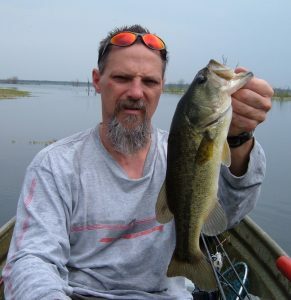 I’d been wondering how my first trip to the fishing hole would shake out in light of the wet spring and the pictures on the internet showing several streams of floodwater flowing over the levees. Well, there was definitely more water, some puzzling stuff with the residents, an irritating (although relatively minor) bit of technical difficulty and a welcome new look in the johnboat. 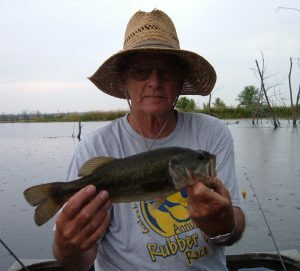 Tag Team – Up until this trip my entire twenty five hours of bass fishing this year were flying solo. Thus it was a welcome change of pace to have Dad decide to team up for another Emiquon adventure. Life gets pretty hectic with my four kids and he and Mom spending time with eight grandkids so it wasn’t overly surprising (although unfortunate) that we’d not had the opportunity to fish together yet this year. He’s been my top fishing partner over the years and it’s always good to have another angler along for ideas, conversation, picture taking and another lure in the water. It doesn’t hurt when that fellow angler also has a nicer truck, a Bass Tracker (outlawed on Emiquon due to a gas motor), is often good for a soda and some chips on the way home and has a friend who lends us an “Emiquon boat.” I got it made. Running Blind – The high water had many of my landmarks submerged making the vast expanse of water all look pretty much the same. Not having a portable depthfinder also made for some head scratching and relatively aimless casting with a few random bass to start our day. 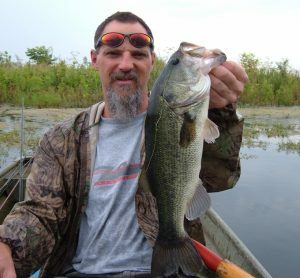 However, we do know a thing or two about the area after thirteen visits and several hundred bass beginning back on April 23, 2009. We do alright but it sure got me wishing that I’d picked up the portable depthfinder I’d checked out in Peoria the previous week. Instead, I decided to feed the family for a few days rather than drop the $120 but maybe next time, the kids all look pretty healthy anyway. 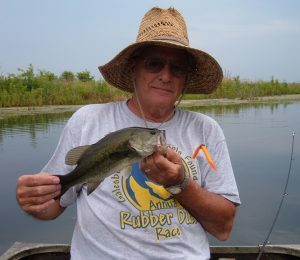 Hungry Bass – Good things can happen for an angler whose lure encounters a hungry bass. But some of those we found looked like they were downright starving. Now I realize that 30 bass is not much for a sample size but there was a noticeable difference in the length to weight ratio in this year’s catch. This is also a new look as the bulk of the hundreds of bass we’ve previously fooled down there set a new standard for quality compared to anywhere else we have ever fished. I will give them credit for fight though as several had me fooled into thinking they were larger than the result. The initial Emiquon seemed to be chock full of stout bass but I now wonder if they have begun to eat themselves out of house and home. Who knows, just an amateur observation. Weather – One thing that wasn’t too different was the wind, even in July. We did have a brief calm spot or two but those were typically around one of the half dozen rain showers that greeted us. Luckily there was no lightning so we rode it out and with temps in the upper 70’s it wasn’t particularly uncomfortable. It also didn’t take too long to dry out, usually right before it rained again. Guesstimation – My old trusty scale was dying during my 7/4 outing so I grabbed a new one at a local store. 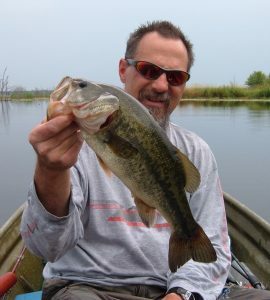 Being on the water without a scale for a meticulous data collector is akin to losing my favorite crankbait and not having a backup. Frustratingly, the new model weighed only a handful of our Emiquon bass while going haywire. 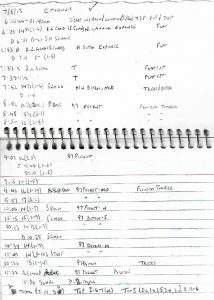 Therefore, several of the weights noted with this report are best guesses from me and Dad. The way I look at it though is that we’ve seen enough bass over the years that we’re just as calibrated as the devices that claim accuracy within an ounce or two. Yet again, Emiquon provided plenty to ramble about, wouldn’t have figured it any other way. 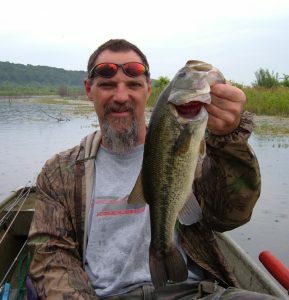 I’ve probably written more about that four year old fishing hole than I have about places I’ve fished for twenty five or thirty years, it’s just that kind of place. It’s been a boon to the record book and the photo album as well. And how much better does it get than being able to create those memories with your dad?